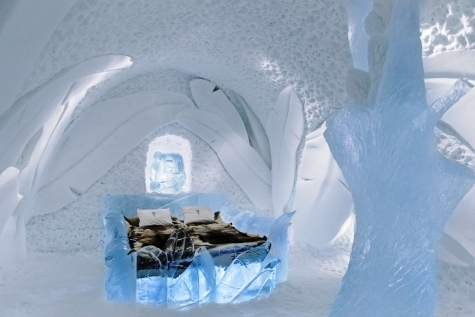 A stay at the ICEHOTEL normally involves one night in cold accommodation, after which you move to a warmer option. The beds in the cold accommodation are made of ice-blocks covered with a thick mattress and reindeer hides. Rooms are a constant -5c to -8c no matter how cold it is outside. Dress warmly in thermal underwear, we also recommend wearing a woolly hat, before sliding into your thermal sleeping bag. Choose from different levels of accommodation to create your bespoke break. An early morning flight to Kiruna (via Stockholm) will enable you to make the most of your break (alternatively, we can arrange a stopover in Stockholm). Transfer to the ICEHOTEL, where you will receive your ‘survival induction’. Be enthralled by your sparkling surroundings or partake in one of the many excursions on offer. Overnight in your preferred cold accommodation. There is still time after breakfast for a brief walk around the village. The Jukkarjarvi Church, with its hand painted wooden alter piece, is worth a visit. Transfer to Kiruna airport for your return flight to the UK (via Stockholm). Stop overs in Stockholm can be arranged please contact us for further information. 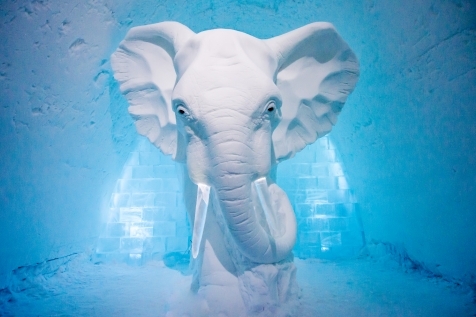 Staying at the ICEHOTEL normally involves one night in cold accommodation and two nights in warm accommodation. The warm accommodation offered is the same regardless of whether you stay in the classic ICEHOTEL or ICEHOTEL 365. All warm accommodation offers private WC/shower, TV, microwave, kettle and Wi-Fi. Kaamos Room: Airy and bright double room decorated in simple Scandinavian decor. Arctic Chalet: A charming wooden chalet with two separate bedrooms ( 1 SGL and 1 DBL), small dining area and living room. Nordic Chalet: A larger chalet with two separate bedrooms (1 DBL and 1 with bunk beds), small dining area and living room. A snowmobile tour that will take you into the wilderness, over frozen lakes and through beautiful arctic Taiga forests. There is a stop at a wilderness camp to enjoy coffee & the traditional Swedish ‘Fika’ cake over an open fire. Take a seat in the sled and experience the sudden silence of the howling dogs as your journey into the surrounding forest begins. Coffee and cake over a campfire included. 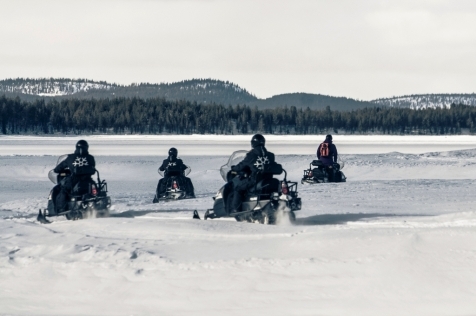 In cooperation with the Swedish Institute of Space Physics, specially trained guides will take you on a snowmobile excursion that takes you in search of the Northern Lights. You will learn the truths and myths about this celestial phenomenon. A 3-course dinner made with local ingredients is served in a wilderness camp. Ride into the Arctic night in search of the Aurora Borealis. 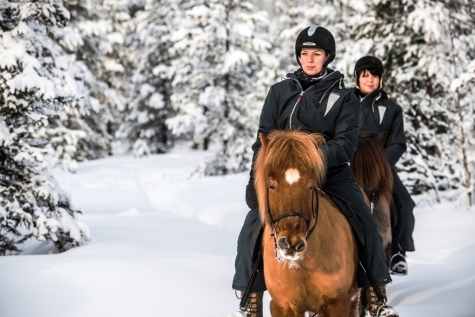 Accompanied by friendly Icelandic horses you will enjoy the silence of the wilderness and dinner along with the chance to spot the Northern Lights. Maximum weight 90KG. Minimum age 12. Join a Sami guide for an encounter with the reindeer and Sami culture. Try a reindeer sled ride around a short track. Hand-feed and learn more about reindeer husbandry and the region’s indigenous people. Hot coffee and tasty ‘suovas’ (the Sami national dish) are served in front of a roaring fire inside a traditional Sami tent.